My friend Chris was saying how much he loves visiting art galleries with a friend of his because not only does he know the stories behind many of the paintings, he is also aware of the historical context in which they were painted. Often, it seems, that certain art movements began in response to something else that was going on at the time: cubism, impressionism… and that’s pretty much where my art history knowledge runs dry. When I lived in central London in the mid-90s the Tate gallery sat on the route between my flat and my work. I would frequently pop in on my way home, and marvel at these enormous works of art by Turner and … Hooch? 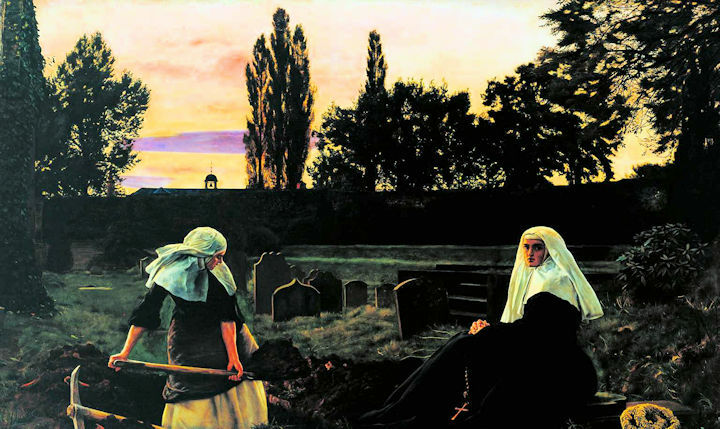 But it was this painting by Sir John Everett Millais that kept bringing me back. There was just something about it that fired my imagination and intrigue. The story behind the painting is interesting, but I knew nothing of that at the time. I was fascinated by the portrayal of the two nuns. One sitting with prayer beads in her hand, looking in the direction of the viewer; the other, with sleeves rolled up, digging a grave. For whom is she digging it? In the distance, above her head there is a bell tower. Ask not for whom the bell tolls, it tolls for thee. The painting is set at dusk, the sun clearly dying in the background. This is a painting that I visit from time to time online. It reminds me of a simpler time in my life, but it also reminds me to slow down and appreciate what I have around me now. The painting suggests a slow pace of life, and a life of honest, hard work amidst gentleness and contentment. And those, for me, are things to aspire to.